Welcome to Nashville Trax, the recording studio many Nashville studio pros call home. Nashville Trax is THE destination for singers, songwriters and independent artists who are seeking the highest-quality recording services using world class professional session musicians. 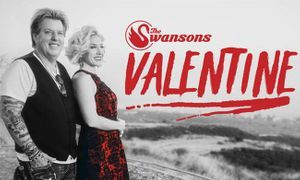 The Swanson's, Country This album produced at Nashville Trax. Listen for the first single "Valentine" now rapidly climbing the radio charts! "I'm lost in it, this is tremendous work!!!... About to listen a few hundred more times! ": -Joe F. regarding Country This cuts Tell Her I'm Sorry" and "Don't You Forget." "Something Unforgettable" and "Mark This Date" are both © 2017 Joseph Finley, produced by Bill Watson, presented here for demonstration of production values only. All other use is prohibited under U.S. and International copyright law. Published by Listen Again Music (BMI). Country This was named "Best Independent Country Album of 2017" by The Producer's Choice Awards, Hollywood, CA. "Dirt Road Princess" © 2017 Cole Tomlinson is presented for demonstration of production values only. All other use is prohibited under U.S. and International copyright law. Credits: Brent Mason: electric guitars; Bill Watson: bass guitar; Jim Riley: drums; Jenee Fleenor, fiddle: Steve King, keybords, Thomas Yankton, bgv's; Cole Tomlinson acoustic guitar and lead vocal. 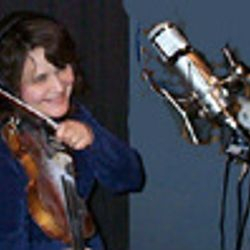 E-mail nashtrax@bellsouth.net to inquire about having a master quality single or album produced; a demo made of an original song; or to inquire about adding instrument tracks played by Nashville session musicians to your self-produced project; or custom live performance tracks for on-stage use. You're standing right there. Listening. It's your music playing back, and man, it sounds better than you ever thought it could! The musicians are high fiving, the friend you brought with is grinning ear-to-ear and life isn't just good, it's GREAT! Congratulations to client Dan Thompson! 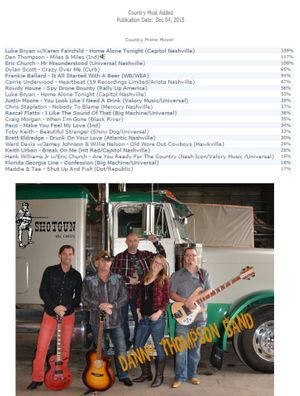 His single Miles and Miles, produced by Nashville Trax and distributed by Sony, is blowing up on country radio! "I wasn't happy with the results from several other Nashville studios I tried- professional sounding but bland, perfunctory and uninspired. 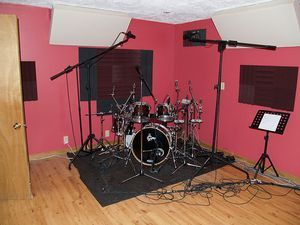 Poking around the web I ran across the Nashville Trax site and something told me they just might be the right studio. 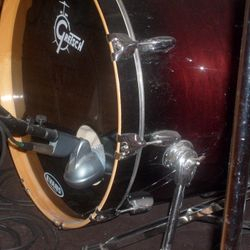 Quality drum kit, no setup required! Zildjian cymbals available, not pictured because session drummers prefer to use their own. 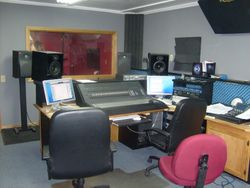 We provide recording time only, or complete turnkey music production for singers, songwriters, and others. We offer the option of recording your songwriting efforts as Nashville style song demos, a Limited Release CD Project or as a Master recording. 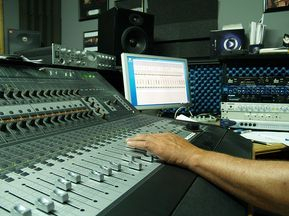 We also offer our "Tracks Online" service which gives you the option of adding our musician's talents to your home-produced project with Drum Tracks Online, Fiddle Tracks Online, Steel Guitar Tracks Online, Vocal Tracks Online and more. No need to worry if your rough is "good enough." Like Jesus, we'll meet you where you are. See the "More" tab menu above. Nashville Trax also offers professional Video Services for promotion of your completed song, promotion of your album or to promote you as an artist. Your music does not have to be recorded at Nashville Trax to use our video services. Placement of your video across all popular social media platforms is also available. Just tell us what you're in need of! WE CAN DO IT! 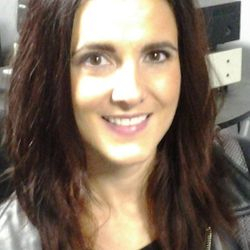 Songwriter Demo Promotion Tips and More! "After 22 years of writing and recording it's nice to FINALLY find a home at Nashville Trax and a music producer in Bill Watson who only accepts the best out of me ." - Brian Bergquist, Manitoba, Canada. Subscribe to our Studio Blog and get 5% off any full band recording quote! These tracks are AWESOME. I am completely blown away. A huge thank you to you, Brent and Jim. "Hey! I finally listened with headphones...The singer is great. He has a lot of expression and makes the song fun.The rap part is terrific! I love the drums, especially the house kick drum that comes in on the chorus. The organ is fabulous, kind of gives the song an underlying rock sound. The lead guitar is great (reminded me of Paisley or Urban). Love the bass! I sort of play the bass so I really love the bass line you played, Bill. I really like the lead into the Norad bit and of course, the Norad bit itself is awesome! The mix is really clean and the song proliferates with rich tones and multiple interesting layers. FABULOUS JOB! Please thank everyone who worked on it for me." Abigail Dempsey of the hugely popular Americana band, Forlorn Strangers. Abigail is one of our studio session singers. Have her sing your song! 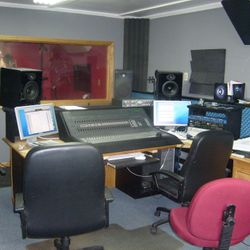 Do you need a Nashville Recording Studio? A Nashville music producer? Instrument Tracks or Vocals to add to your home recording or studio project? Work with the #1 music producer in Nashville at transforming extremely rough work into professional sounding recordings! Listen to the before/afters on our blog! Songwriters, singers, music publishers: Nashville Trax is THE Nashville recording studio ALL about making YOU and YOUR songs sound professional! 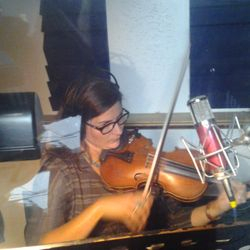 We also offer instrument tracks ADDED TO YOUR SONG played by Nashville session players and session vocalists! Both are available under the "More" tab menu above! Pro Tools HD recording format, the choice of most pro studios worldwide! And then there's the... no, too much to tell, you'll just have to hear it to believe it! Click the middle arrow in the pic below to see an automatic slideshow of the plugins, isolation booth and other gear available to make you sound FANTASTIC at the #1 of all Nashville Recording Studios, Nashville Trax. Performance Tracks! Individual instrument files of your favorite hit songs or your original songs for you to perform live with or record with! Make BIG $ performing at events using our tracks! Mastering! We now offer mastering both on projects recorded here and on any mix no matter where it was done!